Ellingson Excavating has been in existence ever since Ed Ellingson Sr. moved to the Cumberland, WI area from Chicago around 1962. He started by purchasing a dozer to do some logging and farming. By 1968, he eventually ended up doing excavating as a full time job. Ed Jr. has worked for his father ever since he was in Junior High school. Ed Sr. passed the business unto his son Ed Jr. in 1991. Ellingson Excavating has grown over the years and has branched into putting outdoor septic systems in along with continuing to serve excavating needs. 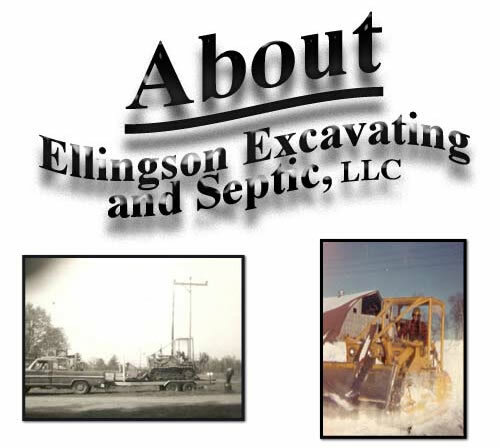 Today, Ellingson Excavating & Septic,llc is still a family owned and operated company that is committed to satisfying its customers with all their excavating and septic needs.